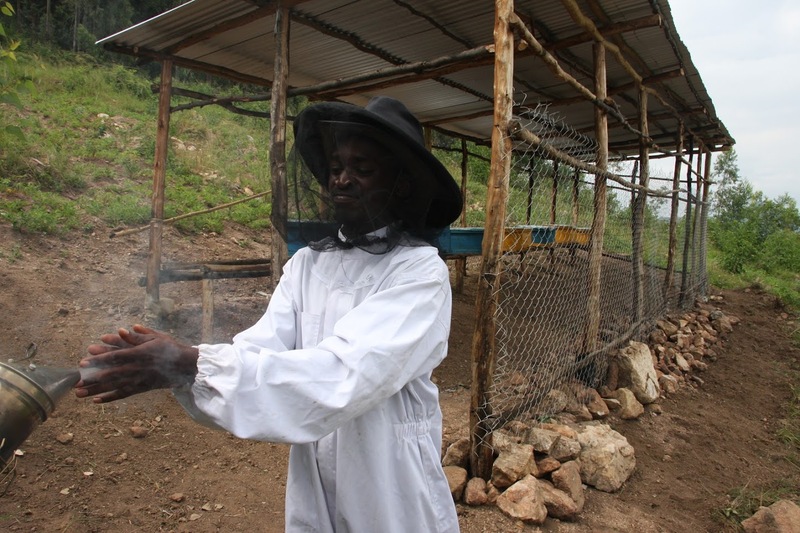 Beekeeping is an older profession in Rwanda which was modernised in 1956. 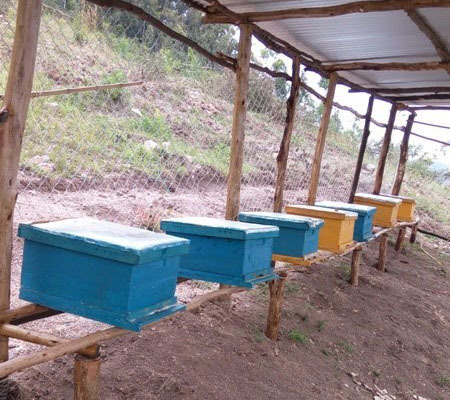 Bee products though are very rare on the Rwanda market and neighbouring countries. Studies show that the most profitable projects are those of the hive langstroth type giving 20-30 kg of honey each crop and harvested 7-9 times per year. The bee products market is really assured (1kg honey 3500frw currently costs). Harvesting starts after 4 months. To Encourage local production of honey and other hive product. 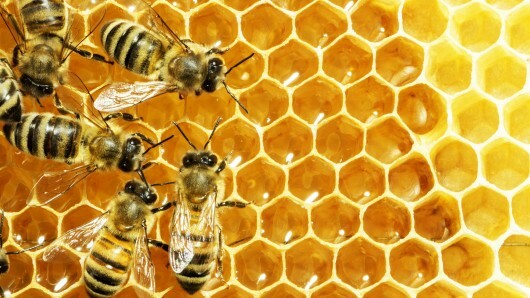 Increase the quantity and improve the quality of organic honey and other bee products. To promote the creation of a sales network of bee products. The direct beneficiaries are Ndahimana Emmanuel, Munymana Protais and family, Macumi Emmanuel and Kwizera Jean Pierre and family, Bakunzi family (he is a technician), Egide family (he is also a technician), Akayezu Claudine, Nyirahabimana Hycinthe and family, Nsengimana Samuel (project coordinator), Nzayisenga Dieudonné and also many neighbours of the project. Generally Gisanga improved beekeeping project started very well; we worked very hard at the start up same as the bees do. And we are expecting that it will continue to be good; the common problem in beekeeping is having a weak colony (type of bees that does not work very good) or the appearance of old queens in the hives, which are not laying enough eggs for reproduction; but we founded the solution. In February I attended a training about queen rearing at Butare, arranged by RAB ( Rwanda Agriculture Board) and my first practice worked out well. Up to date we did the transfer of bees to first 20 modern hives and we have also 15 traditional hives. In fact there are some activities for which we cannot get invoices, such as transport of materials, purchase and cost of plantation of trees for the bees, money paid for workers while constructing the shelter for the hives , money spent in transport for training but up to now we spent 2771000 RwFr, which will be used for the purchase of a honey extractor, and a container for our products. We are expecting our first products at the end of May. When we buy that material we will send the invoices. At this stage there are no problems. The Gisanga “improved beekeeping project” evolves very well. Currently we have 20 modern hives and 15 traditional ones. During the visit of the members of Vleugels van Hoop I showed them the composition of the modern “langstroth” beehives and a few hives which are set at the border of the forest. From 5 hives we got a first harvest of 40 kg of honey. The modern beehives are expensive and therefore are 2 members of our project team now learning to make some themselves. After the purchase of a honey extractor and a recipient for the honey the funds are fully used. The modern beehives are expensive so to extend the project further we’re learning how to make them ourselves.